This is a sort of study in my 42hp case setup. After last-last week's beat on the 360hp ambient monster, I felt like constraining myself somewhat. This case is the result of that endeavor. Mostly, what are hearing is filtered (Disting Mk4 D5 LP/HP mode) Chord Organ alt waveform chords coming through Mannequins /w in a loop programmatically recorded by a Teletype scene made for this week's beat. The chord progression is layered on top of the recorded stuttery whatnot. The Aeverb MkII rounds out the stereo image. Took me a while to discern the photo. First thing it reminded me was of some kind of workbench oscilloscope and the space ship model was a soldiering iron stand. 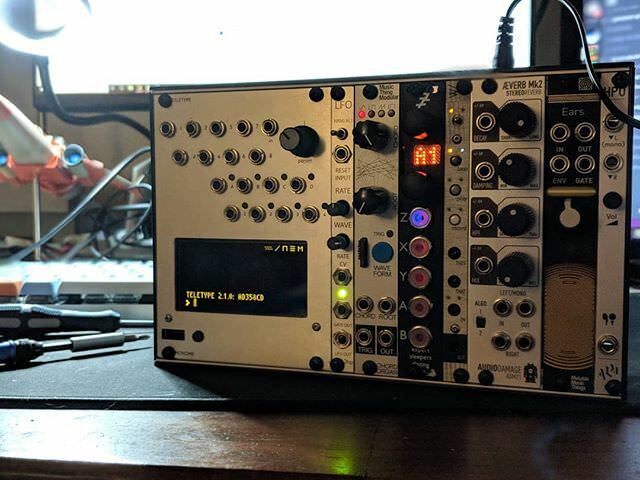 Is that the complete modular set up for this track? Nice rich sounds with a really biting filter. The melody is pleasing and mesmerizing as well. Towards the end, it's as biting as an electric guitar.